TactiCom develops marketing strategies that effectively convey your message to your target audience. We focus on your corporate image, branding and messaging. We clearly communicate and focus on your target markets and demographics. We create systems and campaigns with effective performance monitoring and management. We put the right metrics in place to monitor KPIs, providing a clear "bottom line" business intelligence picture of your campaigns. We can create closed loop systems whereby we interact with your CRM and always focused on and measuring ROI, continually adjusting, maximizing your ROI and lead closure rates. We have a proven track record developing successful strategies and systems for, non-profits, NGO's and small organizations to billion dollar enterprises such as Intel, Sterilite and entertainment industry leaders. 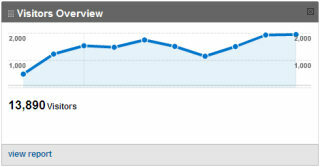 The Goggle analytics graph on the right depicts a 400% increase in web visitors for our TactiCom client! TactiCom maximizes your presence on the Internet through targeting and optimizing your content for (SEO) search indexing. 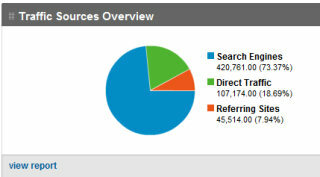 Our technology enables all sites, developed by TactiCom, to be fully indexed by search engines. This is the lowest cost and one of the most effective methods of marketing your products and services on the Internet. Detailed statistics and targeting available, including responsive web design and much more effective, adaptive content by group and by individual user. The graph below depicts 73.37% or 420,761 visitors originating from search engines due to TactiCom search engine optimization and publishing technology. Are these services effective and should they be part of your marketing campaign? For some of our customers they have been the lifeline to new customers and have helped grow their market share exponentially. TactiCom offers consulting, marketing and development services for popular social networking service sites. We can also develop your corporate social network, whereby you have complete control of all content. Email & Banner design, Email/banner detailed tracking and detailed statistical analysis of campaigns. Adjust your advertising based on analysis of the campaign. We are agents for most major search engines and directories therefore; the cost of advertising through us is minimal.